Talk about contrasts! From our very first camping trip into the lush forests around Cultus Lake, BC we went to our next destination of urban pavement: Lakeside RV Park off of Highway 99 in Everett, Washington. To be fair, after first impressions of the "neighborhood", the place was quite livable and suited our goal of being close to shopping. In fact, we got a water-view "lake" side spot right next to the fishing pond. 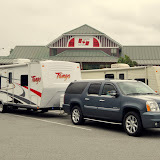 We did lots of time at Camping World, Walmart, and Target as well as doing a little shopping at an outlet mall, and I was able to install and setup a few more things on our travel trailer. Click the thumbnail below to see more photos. I got to climb up on top of the roof of the travel trailer for the first time to install the MaxxAir II vent cover. It allows us to keep the vent open without letting water come in through the opening. I'll need to get up there a few more times because I'd like to get another vent cover for our bathroom vent. I'm glad to say that the Denali handled the extra load quite well on the I-5. It had no problem keeping to the speed limit of up to 70 mph and had passing power when needed. It drove like a big rig, but never felt unstable. As for trailer life, there were several things I learned this trip. It was our first pull-through site and I learned that I could even mess that up! In my excitement I forgot to make a wide enough turn into our spot and I ended up brushing some trees on the left. Back when we were off-roading in the Sequoia, we would brush against trees and shrubs as we drove down narrow trails. We proudly called them "BC pinstripes." On the trailer they're just embarassing! Luckily, I was able to rub them out when I got home. The other thing I learned was because of where the hookups were, we needed an extension to our 15' sewer line. It was nice that Walmart was so close and they had a good collection of RV accessories for us to use. It took me a while to get the hoses connected because our rigid Rhino hose didn't mate well to the flexible extension that I bought. Even though it worked fine, I went back to Camping World to buy a 10' Rhino extension for us to use the next time. I also bought some Lynx Levelers from Walmart that I needed for our Cultus Lake trip last week. For the most part I think we're setup for just about everything now.